OTT Video Consumption is on the Rise. Leverage this Trend to Generate Additional Revenue. 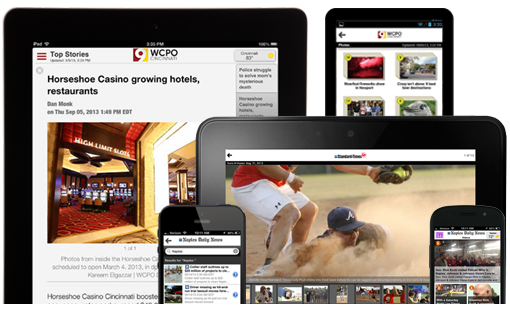 Cloud Mobile Publishing that Media Brands Trust and Content Experience that Readers Love. New media content is produced using myriad internal and external sources. And, consumed by readers on scores of different device types. Publishers are tasked with delivering a unique, seamless, and engaging experience to subscribers, while offering a measurable ROI-driven marketing platform to advertisers. Our fully-customizable ready-to-use solution allows Publishers to avoid the long take-off cycles of internal development effort and future-proof their investment. Leading publishing groups like The E. W. Scripps Company, The Buffalo News, Pittsburgh Post Gazette, and Calkins Media, trust Whiz. MobileNewsPack™ is a white-label mobile solution for news and media publishing industry, which Whiz customizes and delivers as a service, to the Publisher. A typical offering includes customized apps for iPhone, iPad, Android Smartphones and tablets, Kindle Fire, and HTML5 mobile web. Whiz adds mobile apps for select devices as they become available. This future-proofs and relieves publishers from ongoing mobile app development, upgrade, compatibility, and support concerns. Trusted by leading Publications and Broadcast TV stations. Apps targeted for our partners. Why they trust us . . . in their own words. "After a rigorous vendor selection process last year, we selected Whiz to deliver us a customized mobile solution, and it has become a key building block of our mobile strategy and vision. We consider Whiz a key partner as we continue to execute on our mobile strategy in 2014 and beyond." "Whiz Technologies offered us the ability to cover every mobile and tablet device through native applications or HTML 5.0 mobile site." "Whiz allowed us to focus on our mobile strategy while they focused on the technology. If we had built our apps in­house we would still be chasing our goal rather than completing it." "I am very pleased with our working relationship with Whiz -- smart, efficient, solid technology, technical expertise, professionalism and on­time delivery. Best vendor relationship I have ever had on the digital side of newspapers."